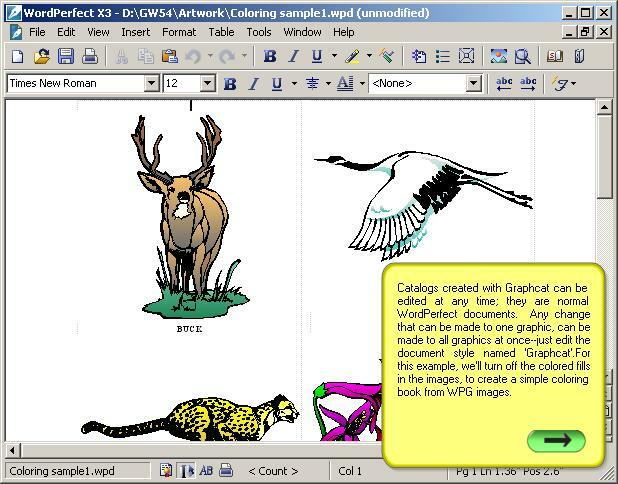 It is possible to create a coloring book in WordPerfect with very little work, if you have the right kind of clip art files. Only vector clip art will work, and not bitmapped (scanned) art. Vector clip art doesn’t contain pictures, but contains the mathematical instructions to create pictures by building it out of shapes and adding fill patterns. WordPerfect can convert all those fill patterns to white, resulting in a coloring-book-style image. These directions will only work in a version of WordPerfect that uses graphic styles. These are used in version 6.0 and above. The directions shown here are in WordPerfect X3, but similar steps work in other versions of WordPerfect. In each case, you will edit a graphic style named Graphcat, and change the fill attributes to white. It does not matter how many images are in the catalog, because you will edit the style that controls all the images, rather than attempting to edit each image individually. The steps shown apply to any group editing of all the images in an album or a catalog, not just a coloring book; the same steps can be used to add fancy borders around photographs, or rotate all the images, so that the image names are on the sides of each image. First, locate the vector clip art. The sample WPG files that ship with WordPerfect are in vector format. Most CGM and WMF files also contain vector drawings. Note that it is possible for a vector file format, like WPG, to contain a scanned/bitmap drawing, and those won’t empty out to a white fill pattern. Next, start WordPerfect, run Graphcat, and create a normal clip art catalog. Settings that work well are two columns, 2.5″ / 8 cm height or one column and an image height as large as that of the blank page without margins. You can enter a child’s name in the page title, such as Coloring Masterpieces by Chris. On the Graphcat options screen, choose Small Margins, Center Images, and Borders: None. Once Graphcat has finished creating the catalog, you’ll need to edit one style to change the fill patterns of all the images to white. From the WordPerfect 8 menu, select Tools, Graphic Styles..
A new dialog box will appear, titled Graphic Styles. At the bottom, choose List styles from Current Document. At the top of the dialog, Box should be checked. In the list of Styles, scroll down as needed, click once on Graphcat and then click on Edit. Another dialog box will appear, titled Edit Box Style. Click on Settings. Yet another box, titled Image Settings, will appear. The preview box at the right will be gray–this is normal, because you are editing a style, rather than an image. Click on Fill Attributes, and then on White, and then on OK. Finally, click on OK and Close as needed to return to the document. All the images should now be ready for printing and coloring. If any still have color in them, they are probably bitmapped or scanned images, and not in vector format. Print the completed coloring book normally. Prepare for quiet time. Enjoy.